Hello everyone. I'm having a problem with my stepper motor,it appears to lock up on speeds higher than 8mm/s. It's only my Y axis motor that does this,my Z axis uses the same motor and stepper drivers and it works fine. In the video I hooked up another motor to the Y axis cable to show that the problem isn't mechanical. I've reinstalled Marlin and checked the wiring. I've replaced the stepper motor,cables and the driver. Nothing changes. I have even tried switching Y and X outputs on the RAMPS board from the original code and the problem still appears on the Y ,even if it has switched places the problem follows it. What could be causing this issue? It's running at 1/16 step. My 3D printer is limited to 8 mm/s printing because of this which is really really slow. Edited 1 time(s). Last edit at 12/20/2018 11:49AM by hermanelfino. If so, have you calculated the actual step rates Marlin must generate to reach your desired speed and compared this with the limits of your controller setup? According to the table on the step rates page of the RapRap Wiki, using an M8 thread with Marlin on Mega/Ramps with 1/8 micro stepping is limited to 12mm/sec - which corresponds to about 6mm/sec with 1/16 micro stepping. Interesting,I'll try reducing the microstepping. But why does the motor lock up even without it being hooked to the screw? Please explain us the mechanical setup of your axis. What belts/pulleys resp threaded rods are you using on which axes? How is your setting of STEPS/mm for the axes in Marlin's Configuration.h? The problem is your very high value of 2048 steps/mm on the Y axis. To achieve a good movement speed with that steps/mm, you will need a combination of fast electronics and firmware to generate the step pulses fast enough, and a low inductance stepper motor and at least 24V power to provide sufficient torque at high motor RPM. Reducing microstepping will mitigate the limitation of your electronics, but not the reduction of torque at high rpm. Your best bet may be to change to either a belt drive or a leadscrew with a course pitch. But why does my motor lock up even while not hooked to the rod as seen in my video? Probably because there is not enough supply voltage to run the motor that fast. Reducing the Y acceleration may allow it to go a little faster. Changing to 24V power (assuming you are using 12V) would be likely to more than double the achievable speed. If the smaller stepper motor has high inductance, the same considerations will apply. 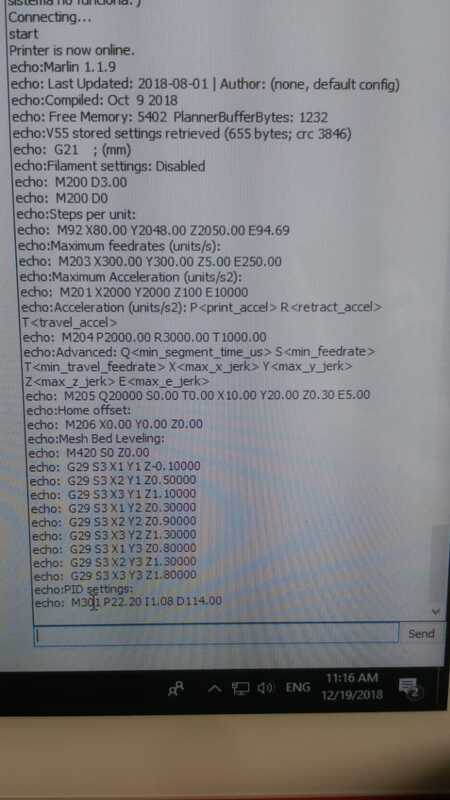 There is a calculator at reprapfirmware.org to calculate the speed at which torque starts to drop. Have you tried reducing Y acceleration? Hermanelfino, have you checked the Wiki page about maximum step rates? IMHO you are simply trying to operate the M8 Y-axis at a step rate which is way to high for the Marlin/Mega setup you have. With 2048 steps/mm you will reach the safe limit of 10000steps/sec at about 5mm/sec - so I wouldn't even trust the 8mm/sec you are using. This has nothing to do with the stepper motors you use, it's the Marlin software on the 16Mhz Mega that reaches its limit. Edited 1 time(s). Last edit at 12/22/2018 05:37AM by enif. Put a 200 teeth GT2 pulley (can be found on this forum) on the motor, a 20 teeth on the M8 screw, a closed GT2 belt, high temp lithium based lubricant for the M8 "et voila" ! Edited 1 time(s). Last edit at 12/22/2018 10:57AM by MKSA.